Product #2866 | SKU AG-MC200G | 0.0 (no ratings yet) Thanks for your rating! The Panasonic AG-MC200G is a camera mounted condenser microphone with superior directional characteristics than that of standard unidirectional microphones. 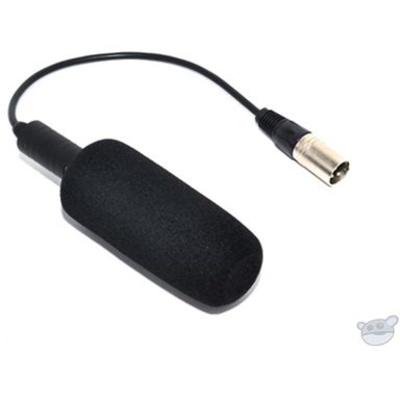 The focused pickup of the AG-MC200G eliminates audio at the sides of the microphone, greatly reducing ambiance and potential feedback problems. The AG-MC200G uses +48V phantom power and features a standard XLR output. The microphone is ideal for camera use, as well as portable recording devices and field mixers. The super-directional characteristic of the AG-MC200G rivals standard unidirectional microphones. The AG-MC200G is ideal for isolating signal in high noise environments. The balanced 3-pin XLR output provides high signal gain and low noise floor. The AG-MC200G uses standard +48v phantom power.